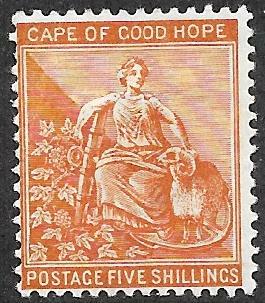 Cape of Good Hope: 1855-63, 1d rose. SG 5a. Good used with margins all round. 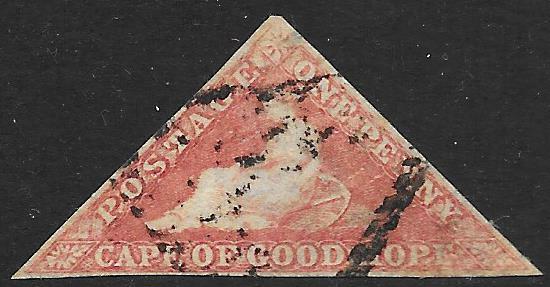 Cape of Good Hope: 1855-63, 1d rose. SG 5a. Very good used with generous margins all round. 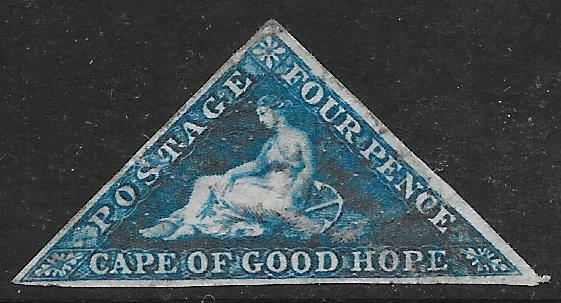 Cape of Good Hope: 1855-63, 4d deep blue/white paper SG 6. Very fine used with good margins all round. 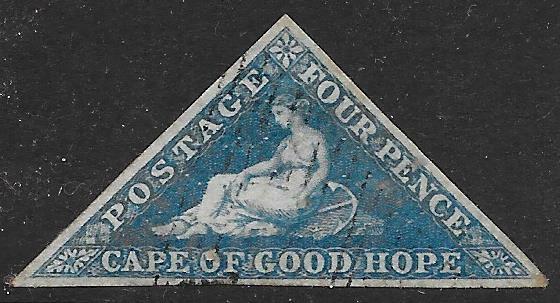 Cape of Good Hope: 1855-63, 4d blue/white paper SG 6a. Very fine used with good margins all round. 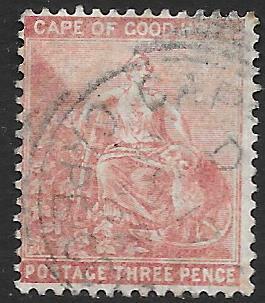 Cape of Good Hope: 1855-63, 6d pale rose-lilac. SG 7. Good used with good margins all round. 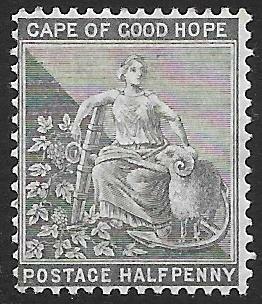 Cape of Good Hope: 1871-76, ½d grey-black. SG 28. Mounted mint. 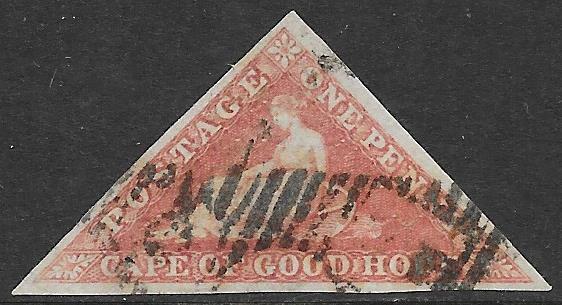 Cape of Good Hope: 1871-76, 1d carmine-red. SG 29. Mounted mint. 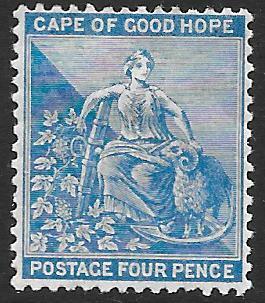 Cape of Good Hope: 1871-76, 4d dull blue. SG 30. Mounted mint. 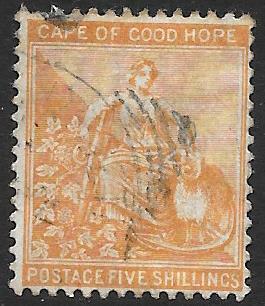 Cape of Good Hope: 1871-76, 5/- yellow-orange. SG 31. Good used. Cape of Good Hope: 1874-76, 1d on 1/- green. SG 33. Good used. Cape of Good Hope: 1880, 3d pale dull rose. SG 36. Good used. 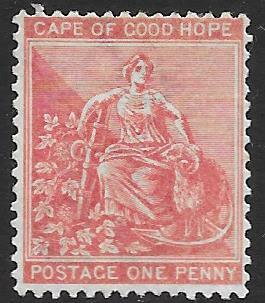 Cape of Good Hope: 1881, 3d pale claret. SG 39. Mounted mint. 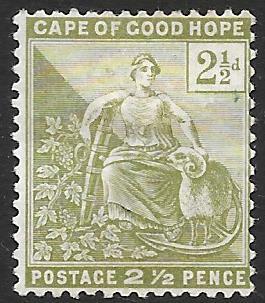 Cape of Good Hope: 1882-83, 2d pale bistre with wmk inverted. SG 42w. Fine used with nice Port Elizabeth CDS. 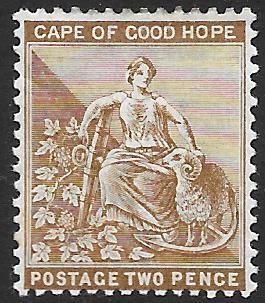 Cape of Good Hope: 1884-90, 2d pale bistre. SG 50. Mounted mint. 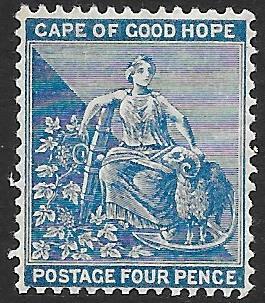 Cape of Good Hope: 1884-90, 4d blue. SG 51. Mounted mint. 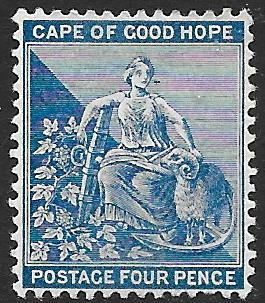 Cape of Good Hope: 1884-90, 4d deep blue. SG 51a. Mounted mint. 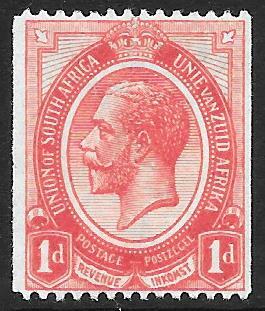 Cape of Good Hope: 1891, 2½d on 3d pale magenta, '1' with horiz serif. SG 55b. Good used. 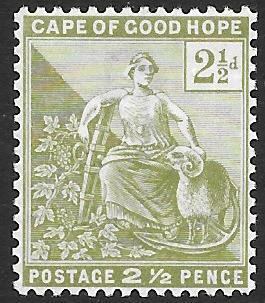 Cape of Good Hope: 1892, 2½d sage-green. SG 56. Mounted mint. 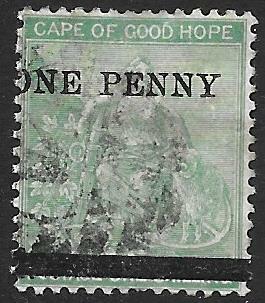 Cape of Good Hope: 1892, 2½d olive-green. SG 56a. Unmounted mint. 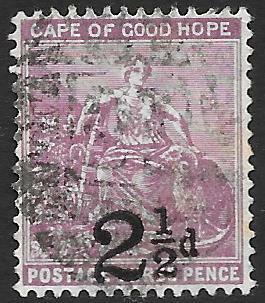 Cape of Good Hope: 1893, 1d on 2d pale bistre, no stop after PENNY. SG 57b. Mounted mint. 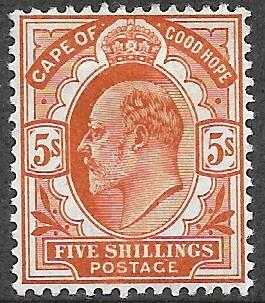 Cape of Good Hope: 1896, 5/- brown-orange. SG 68. Mounted mint. 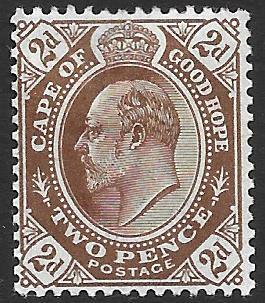 Cape of Good Hope: 1902-04, 2d brown. SG 72. Mounted mint. 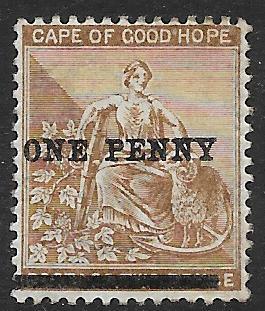 Cape of Good Hope: 1902-04, 5/- brown-orange. SG 78. Mounted mint. 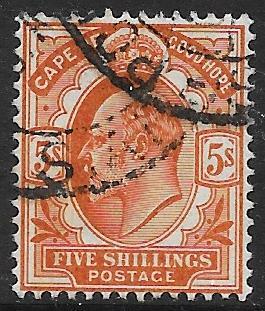 Cape of Good Hope: 1902-04, 5/- brown-orange, SG 78. Very fine used. 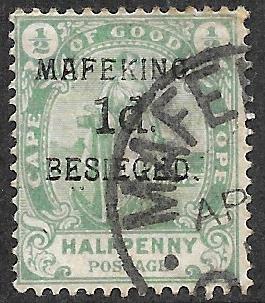 Mafeking Siege Stamps: 1900, 1d on ½d green. SG 2. Good used. 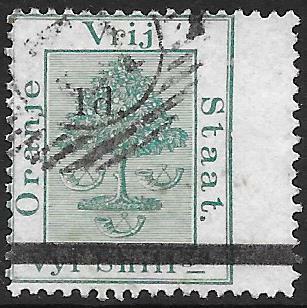 Vryburg: 1899, ½d green. SG 1. Fine used. 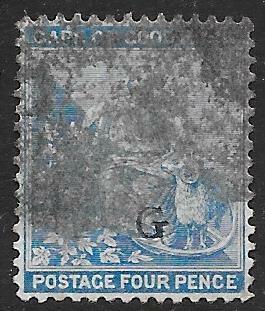 Griqualand West: 1878, 4d dull blue, SG 20. Fine used. Natal: 1862, 6d grey. SG 13. Good used. 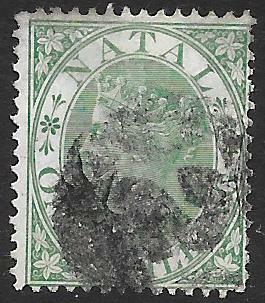 Natal: 1867, 1/- green. SG 25. Good used. 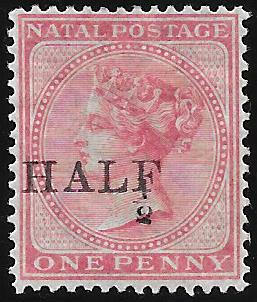 Natal: 1874-99, 5/- rose. SG 72. Fine used. 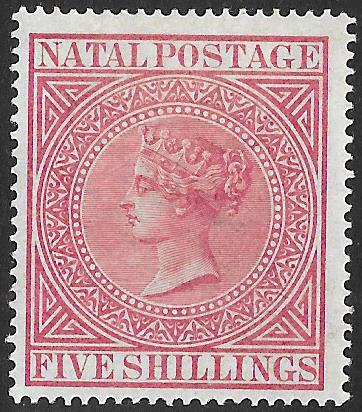 Natal: 1899, 5/- carmine. SG 73. Mounted mint. 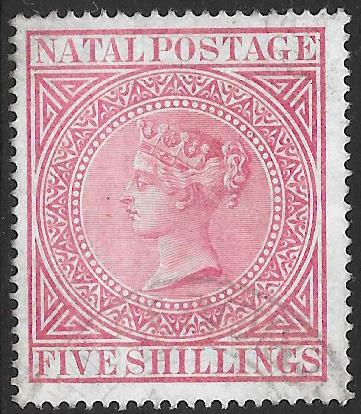 Natal: 1877, ½ on 1d rose (d). SG 88. Mounted mint. 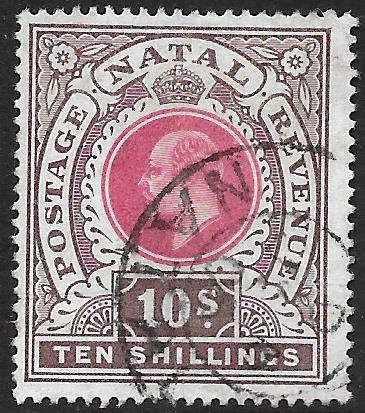 Natal: 1902, 10/- deep rose & chocolate. SG 141. Fine used. 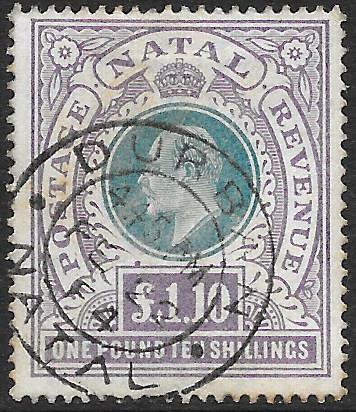 Natal: 1902, £1.10/- green & violet. SG 143. Fine used. 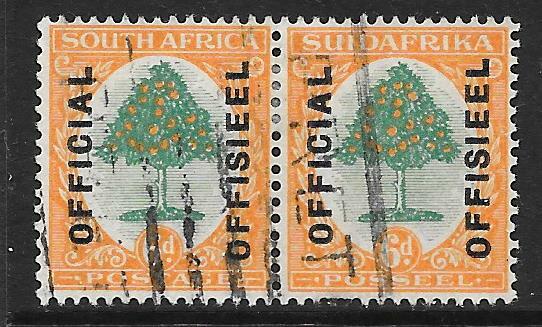 Orange Free State: 1878, 5/- green. SG 20. Fine used. 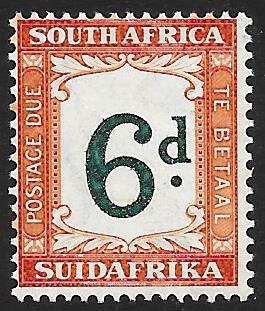 Orange Free State: 1881, 1d on 5/- green. SG 21. Fine used. 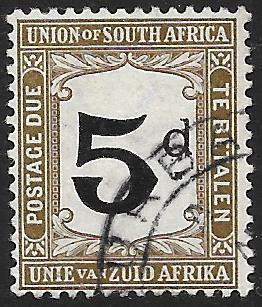 Transvaal: 1895-96, 5/- slate, SG 212. Mounted mint. 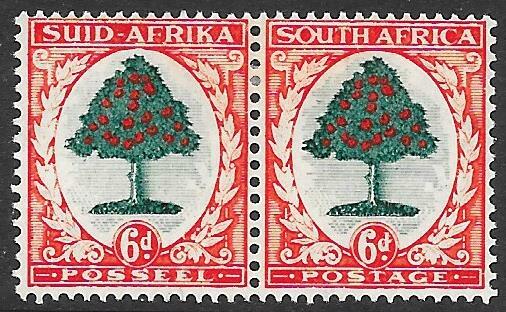 Transvaal: 1895-96, 10/- pale chestnut, SG 212a. Mounted mint. 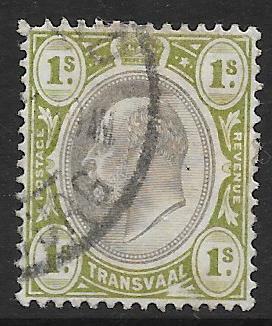 Transvaal: 1902, 1/- black & sage-green, SG 251. Very fine used. 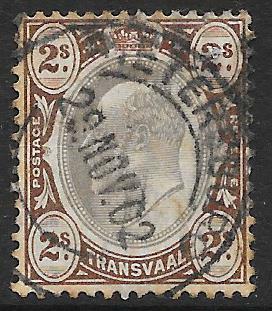 Transvaal: 1902, 2/- black & brown, SG 252. Very fine used. 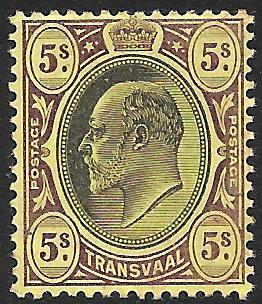 Transvaal: 1902, 5/- black & purple/yellow. SG 254. Mounted mint. 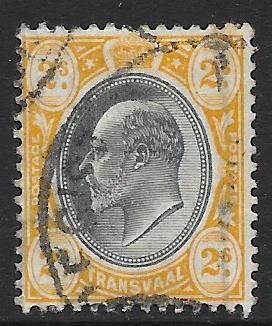 Transvaal: 1903, 2/- grey-black & yellow, SG 257. Very fine used. 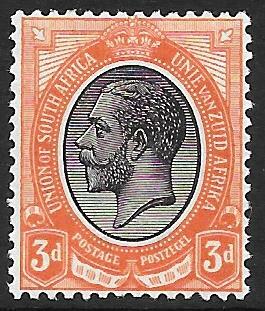 Transvaal: 1904-09, 6d black & orange, wmk inverted. SG 266w. Very fine used. 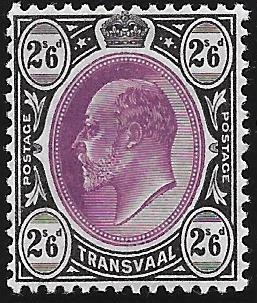 Transvaal: 1904-09, £1 green & violet, ordinary paper. SG 262a. Fine used. 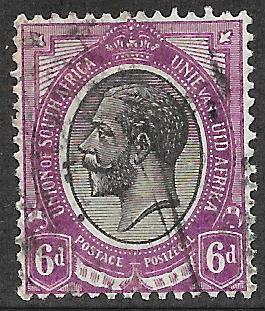 Transvaal: 1909, 2/-6d magenta & black. SG 269. Lightly mounted mint. 1913-24, 3d black & orange-red, wmk inverted. SG 8w. Mounted mint. 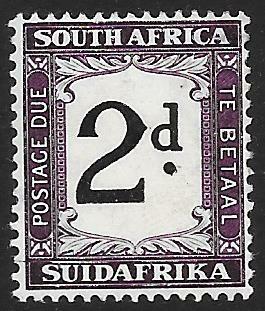 1913-24, 6d black & violet, missing 'z' in zuid. SG 11 (var). Fine used. 1916, £1 green & red. SG 17. Fine used. 1914, 1d rose-red, coil stamp. SG 19. Mounted mint. 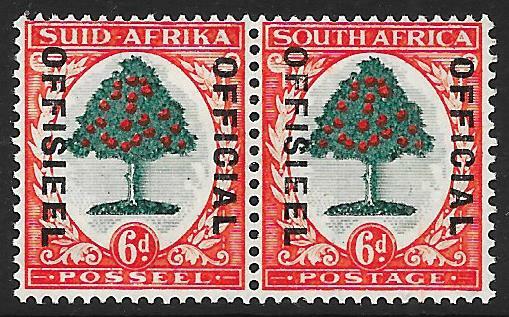 1926-27, 6d green & orange bi-lingual pair. SG 32. Mounted mint. 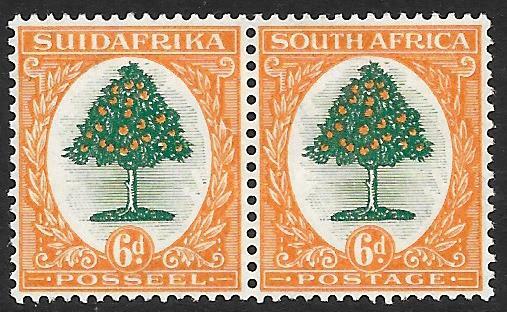 1926-27, 6d green & orange bi-lingual pair. SG 32. Fine used. 1927-30, 3d black & red bi-lingual pair. SG 35. Fine used. 1927-30, 1/- brown & deep blue bi-lingual pair. SG 36. Very fine used. 1927-30, 2/6 green & brown bi-lingual pair. SG 37. Unmounted mint. 1927-30, 5/- black & green bi-lingual pair, perf 14 x 13½. SG 38a. Unmounted mint. 1927-30, 10/- bright blue & brown bi-lingual pair. SG 39. Fine used. 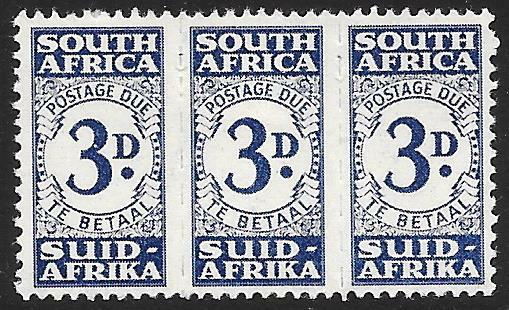 1927-30, 10/- bright blue & brown bi-lingual pair, perf 14 x 13½. SG 39b. Fine used. 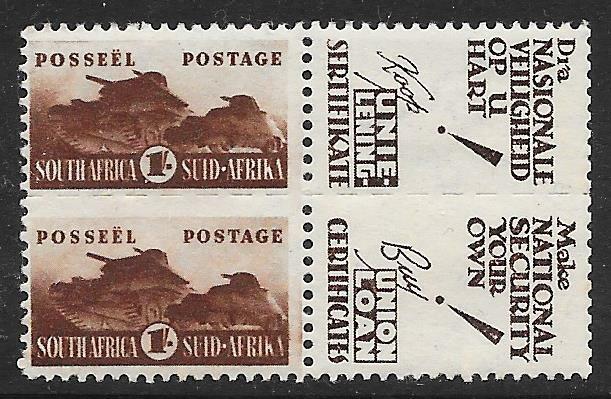 1931, 2d slate-grey & lilac bi-lingual pair. SG 44. Mounted mint. 1930-44, 3d black & red bi-lingual pair, wmk inverted. SG 45aw. Mounted mint. 1930-44, 3d black & red bi-lingual pair, wmk inverted. SG 45aw. Fine used. 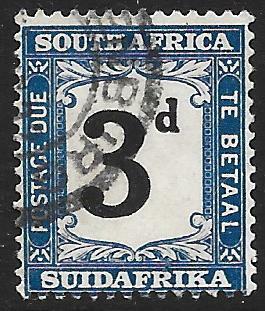 1933, 3d blue bi-lingual pair. SG 45c. Mounted mint. 1930-44, 1/- brown & deep blue bi-lingual pair. SG 48. Mounted mint. 1930-44, 1/- brown & deep blue bi-lingual pair, wmk inverted. SG 48bw. Fine used. 1930-44, 1/- brown & deep blue bi-lingual pair with twisted horn flaw. SG 48c. Very fine used. 1930-44, 2/-6d green & brown bi-lingual pair. SG 49. Fine used. 1930-44, 2/-6d green & brown wmk inverted bi-lingual pair. SG 49aw. Very fine used. 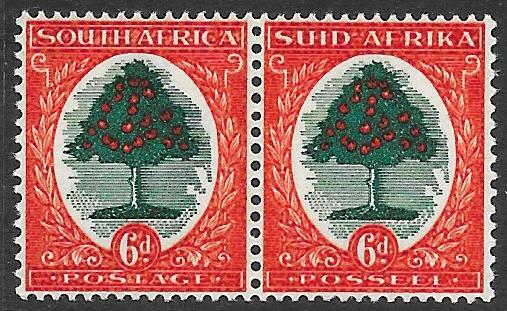 1933-48, ½d grey & green bi-lingual pair, wmk upright. SG 54aw. Mounted mint. 1933-48, 1½d green & bright gold bi-lingual pair, "flag on chimney at right". SG 57c. Mounted mint. 1938, 2d blue & violet gold bi-lingual pair. SG 58. Mounted mint. 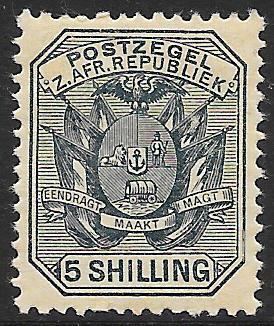 1933-48, 2d grey & dull purple bi-lingual pair. SG 58a. Mounted mint. 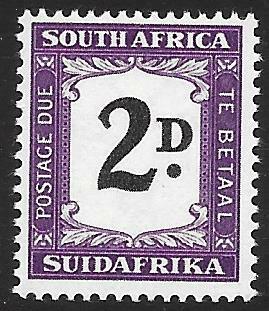 1933-48, 2d grey & dull purple bi-lingual pair. SG 58a. Very fine used. 1937, 6d green & vermillion bi-lingual pair. SG 61. Mounted mint. 1938, 6d green & vermillion bi-lingual pair. SG 61c. Unmounted mint. 1939, 1/- brown & chalky blue bi-lingual pair. SG 62. Unmounted mint. 1933, 5/- black & green bi-lingual pair. SG 64. Unmounted mint. 1944, 10/- blue & charcoal bi-lingual pair. SG 64ca. Unmounted mint. 1938, Voortrekker Centenary Memorial Fund. SG 76-79. Mounted mint. 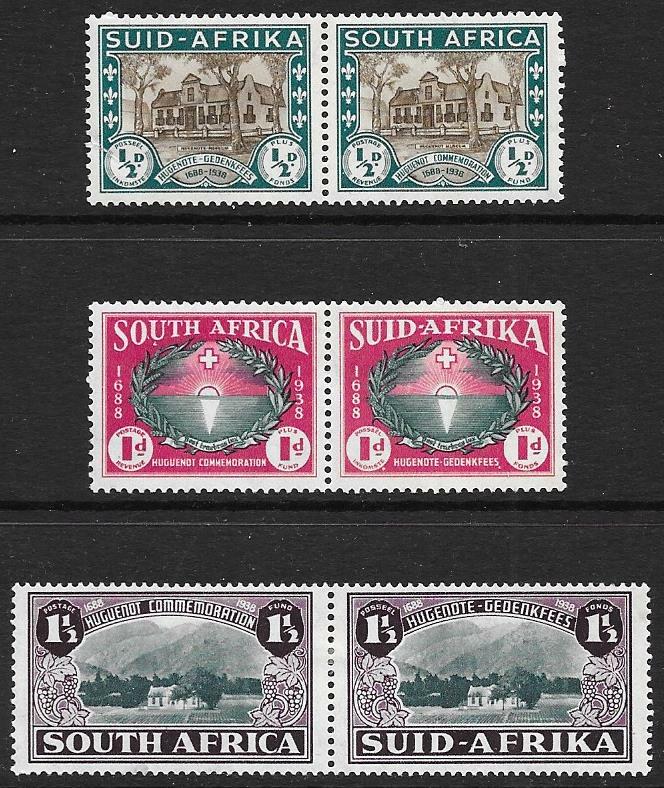 1939, 250th Anniv of Huguenot Landing in South Africa bi-lingual pair Set of 3. SG 82-84. Mounted mint. 1941-46, War Effort. 3d blue bi-lingual pair. SG 91. Very fine used. 1941-46, War Effort. 4d orange-brown bi-lingual pair. SG 92. Unmounted mint. 1942-44, War Effort. 1/- brown bi-lingual pair. SG 104. Mounted mint with advertising label. 1945-47, 2d slate & deep reddish violet bi-lingual pair. SG 107. Mounted mint. 1952, 1/- blackish brown & ultramarine bi-lingual pair. SG 120a. Fine used. 1947-54, 5/- black & pale blue-green bi-lingual pair. SG 122. Mounted mint. 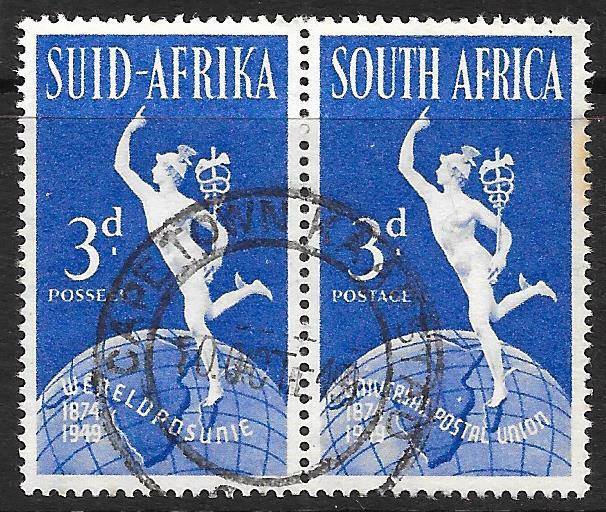 1949, 3d bright blue bi-lingual pair with "lake" in East Africa variety. SG 130b. Fine used. 1915, 5d black & sepia. SG D5. Very fine used. 1927-28, 3d black & blue. SG D20. Very fine used. 1933, 2d black & deep purple. SG D23. Mounted mint. 1942, 3d indigo & milky blue. SG D28a. Mounted mint. 1933, 6d green & brown-ochre, wmk inverted. SG D29. Mounted mint. 1943-44, 3d indigo. SG D33. Mounted mint. 1949, 2d black & violet. SG D36. Unmounted mint. 1949, 6d green & bright orange. SG D38. Unmounted mint. 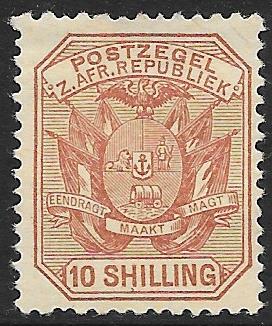 1928-30, 2d grey & maroon bi-lingual pair. SG O5. Fine used. 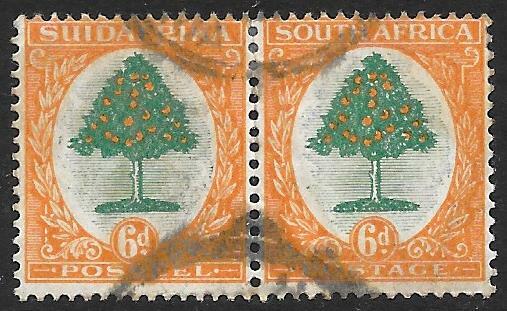 1928-30, 6d green & orange bi-lingual pair. SG O6. Mounted mint. 1928-30, 6d green & orange bi-lingual pair. SG O6. Very fine used. 1931, 1/- brown & deep blue bi-lingual pair. SG O10. Unmounted mint. 1929-31, 2/-6d green & brown bi-lingual pair. SG O11. Mounted mint. 1930-47, 1/- brown & deep blue bi-lingual pair. SG O17. Mounted mint. 1933, 1/- brown & deep blue bi-lingual pair, lines of opt 21mm apart (wmk inverted). SG O17b. Mounted mint. 1933, 2/-6d green & brown bi-lingual pair. SG O18. Mounted mint. 1934, 2/-6d green & brown bi-lingual pair, lines of opt 21mm apart. SG O18a. Good used. 1939, 2d blue & violet bi-lingual pair. SG O23. Unmounted mint. 1937, 6d green & vermillion bi-lingual pair. SG O24. Mounted mint. 1940, 5/- black & blue/green bi-lingual pair. SG O28 Lightly mounted mint. 1949, 1½d blue-green & yellow-buff bi-lingual pair. SG O34. Unmounted mint. 1953, 1/- blackish brown & ultramarine bi-lingual pair. SG O47a Mounted mint. 1953, 1/- blackish brown & ultramarine bi-lingual pair. SG O47a Very fine used. 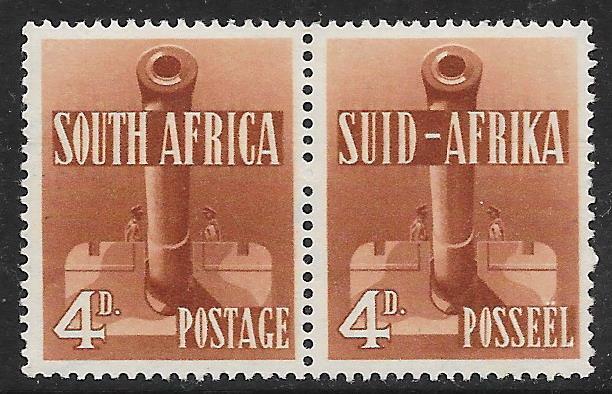 Other South Africa stamps in stock. Please enquire if what you're looking for is not shown above (sales@sh-stamps.co.uk) or if you are looking for individual values.